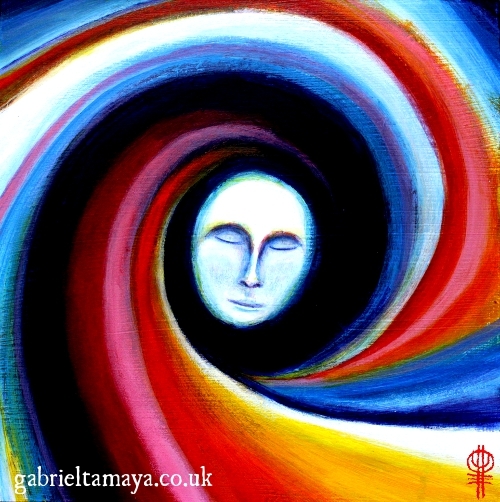 ‘The Calling’…letting go, surrendering to that current pulling us ever onward to the path that awaits us. This piece is taken from some drawings I did mapping the changes in my personal spiritual path, and is for all of us who feel called so strongly to a particular path or change in direction that like skidding on ice, all we can do is hold on and surrender…exhilarating if somewhat terrifying at the same time! This painting is about finding the peace, the still point in this process… the point where we have let go, but not yet arrived. This painting is dedicated to all of you courageous warriors, those who are willing to take a risk and step forward, letting go of the familiar, comfortable and safe to allow for the possibility of something more spacious and luminous into your lives! Here’s to having the courage to surrender, let go and be truly free!